This is an advanced loaf soap tutorial showing a layering technique using Melt and Pour Soap Base with Jelly Soap Base. 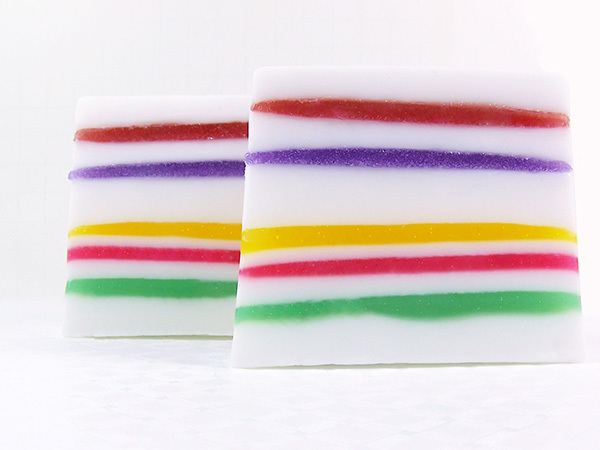 For more information on how to work with the Jelly Soap Base, check out the Basic Jelly Soap Tutorial. In this soap making project we’re creating a beautiful, colorful, and fun soap that’s unique because of its Jelly Soap stripes. Cut up 32 oz. of White Melt & Pour Soap Base into small cubes. 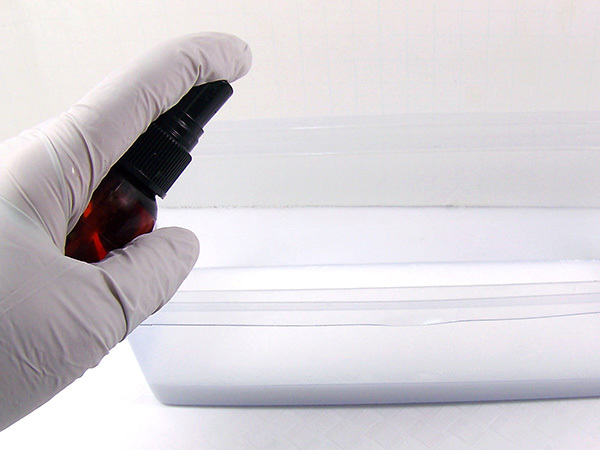 Taking cubed soap base, place in a microwave safe glass container. Melt in the microwave in 30-second bursts until melted. Be careful to not to boil the soap base – boiling will result in a poor quality rubbery soap. 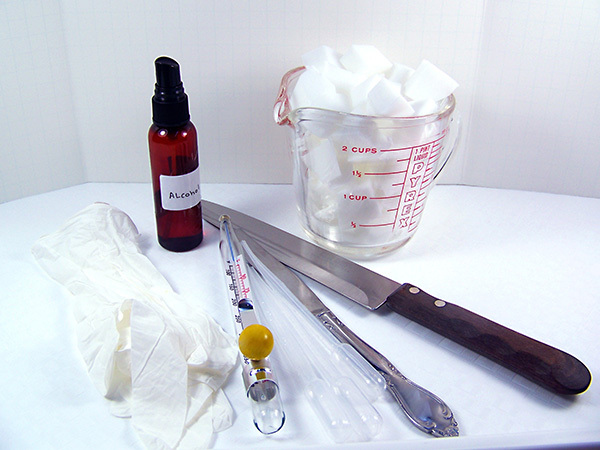 Using a disposable pipette, and 11 ml of Cranberry Salsa Fragrance Oil. Stir slowly until mixed well. 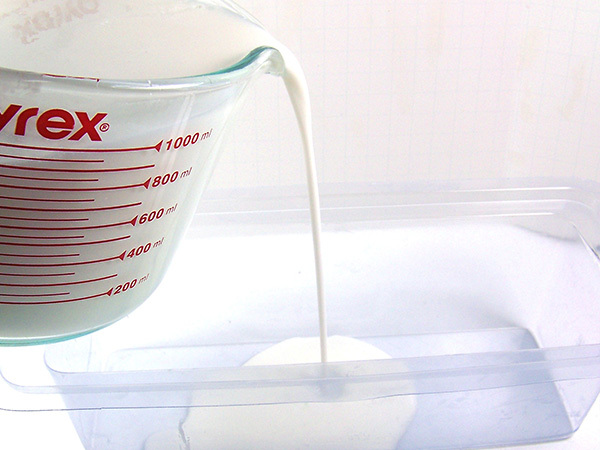 Use a thermometer to monitor the soap base temperature – it should be about 135 – 145° to avoid warping the soap mold. 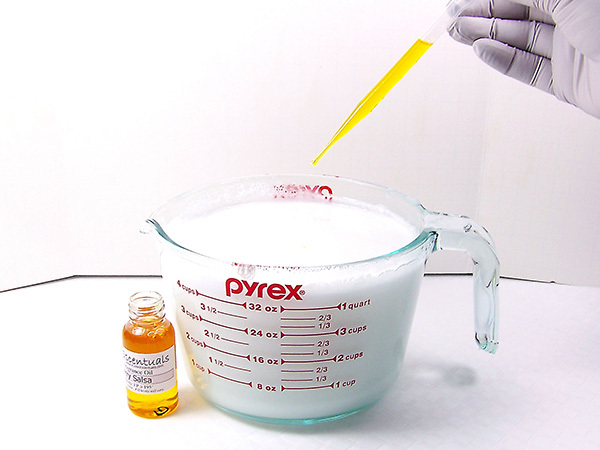 If soap is too hot, keep stirring slowly until soap reaches desired temperature. 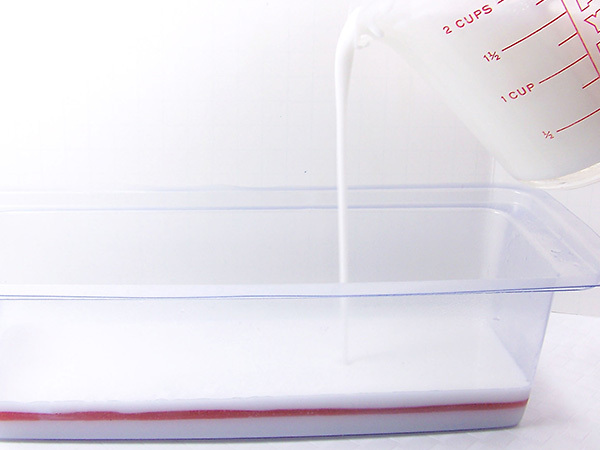 Pour a small amount of white soap base into the Square Loaf Soap Mold. 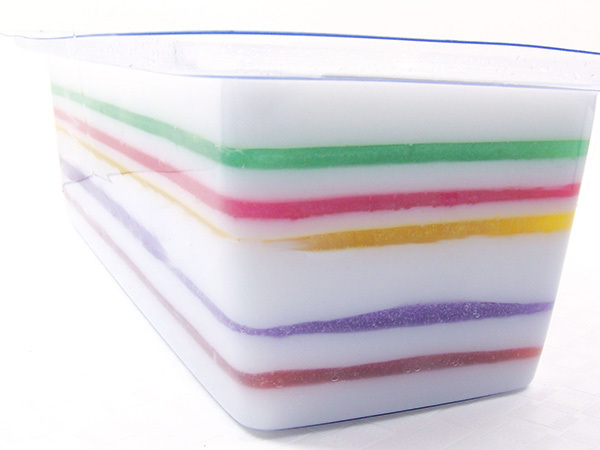 After the first layer is poured, the rest of the scented soap base can be separated into smaller cups at this stage to avoid having to melt the larger container each time a new white layer is needed. Optional: Each layer can be poured in any amount of your choice. For this tutorial, the layers vary from 2 to 6 ounces. 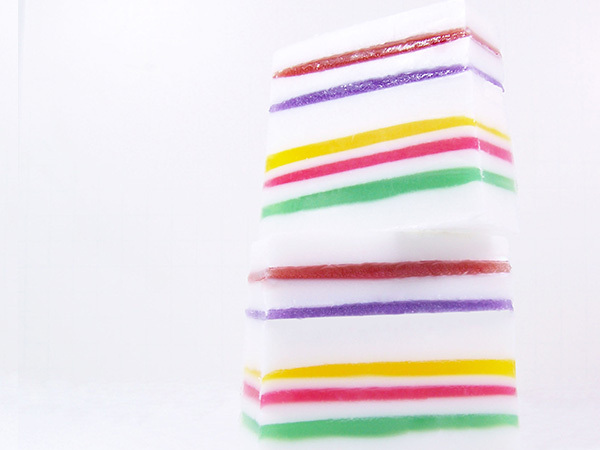 This soap tutorial is more about creativity than exact measurement of layers. 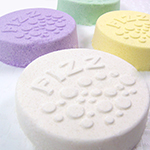 Spritz the soap with alcohol to get rid of any bubbles that formed while pouring. Let soap sit for about 5 minutes to form a hardened layer, then put in the freezer for 8 – 10 minutes to cool the layer. The Jelly Soap Base will be poured at a warmer temperature so it’s necessary to cool the white soap layer as much as possible to avoid any melting. 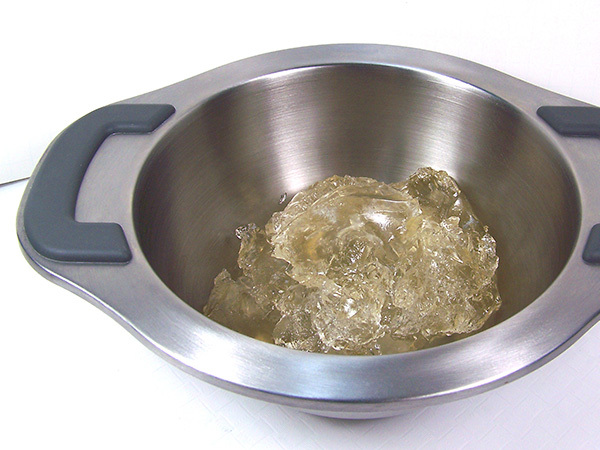 While the first layer is cooling and hardening, prepare the Jelly Soap Base. 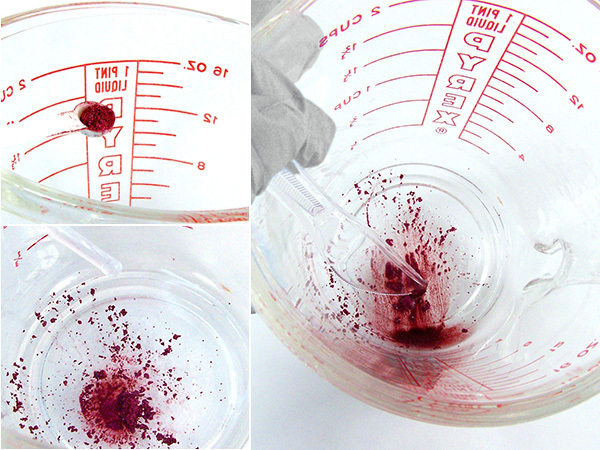 Add 2 scoops of Sangria mica to a small microwave-safe container, add 5 drops of alcohol and mix thoroughly. This will help the mica mix evenly into the Jelly Soap Base. 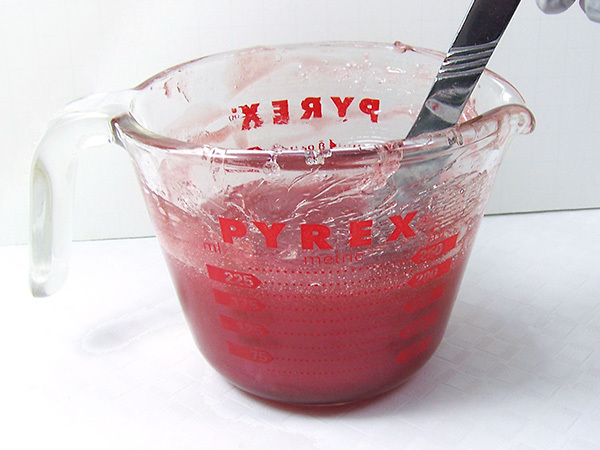 Add about 4 to 5 ounces of Jelly Soap Base to a microwave safe container. Cut up the Jelly Soap Base into small pieces to speed up the melting. Melt for approximately 15 seconds. Follow up with 15-second increments until fully melted. Be careful because this base can easily boil in a microwave. 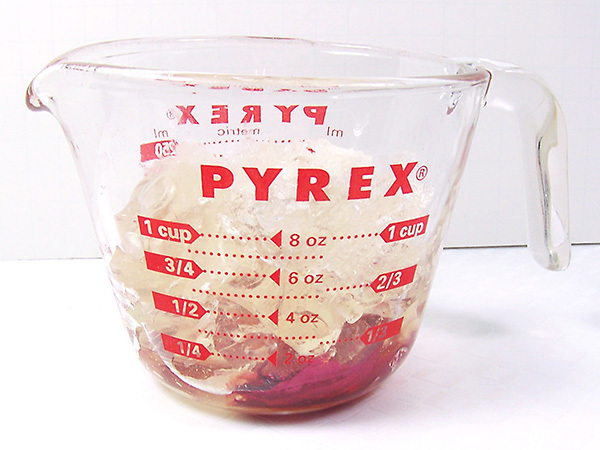 Once completely melted, stir slowly to fully incorporate the mica and Jelly Soap Base together. 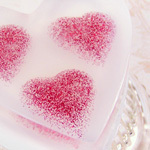 No need to add fragrance oil to scent the thin Jelly Soap layers. Remove the soap from the freezer and spritz with alcohol. 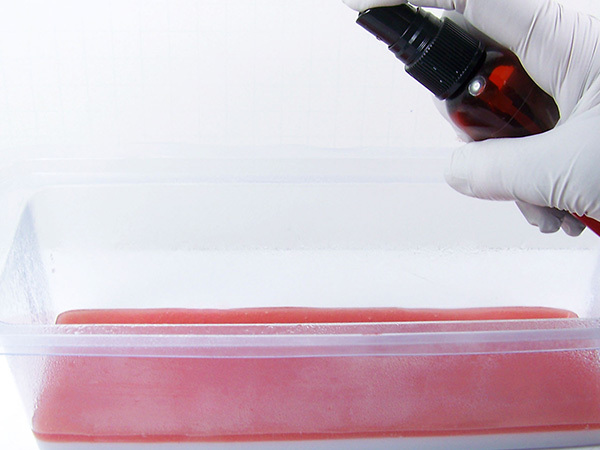 Pour the Jelly Soap into the mold over the white layer. 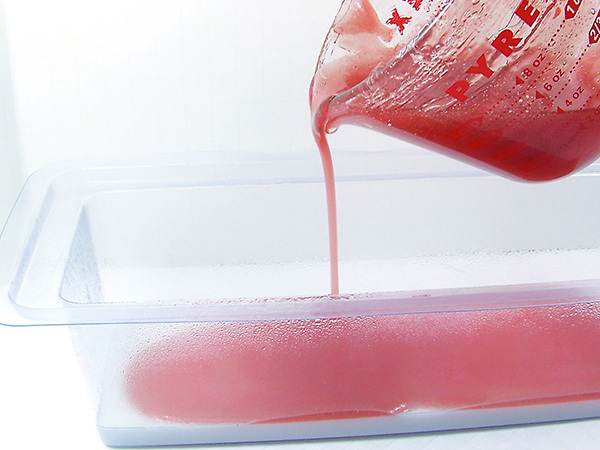 Once poured, let set until the jelly soap thicken and then place in the freezer for approximately 5 minutes. 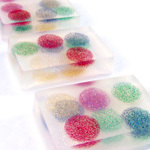 The jelly soap may move and jiggle while warm, however, once cooled off in the freezer it will adhere to the melt and pour soap. When the 2nd layer is set, spritz with alcohol and pour another 4 oz of white soap base, spritz, allow to set, then repeat for another 8 – 10 minutes in the freezer. If the white soap base in the container has hardened, re-heat as needed. 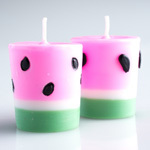 Once the 3rd layer is set, repeat step Steps 8 to 13 alternating Jelly Soap layers with the white scented melt & pour soap. The rest of the remaining four Jelly soap layers are made with 2 scoops each of Purple Passion, Buttercup, Ooh La La and Harlequin Shimmer Mica. Important! It’s important to place each layer into the freezer after it has set a bit. This will cool the layers which will prevent any melting between them and help the layers adhere together faster. 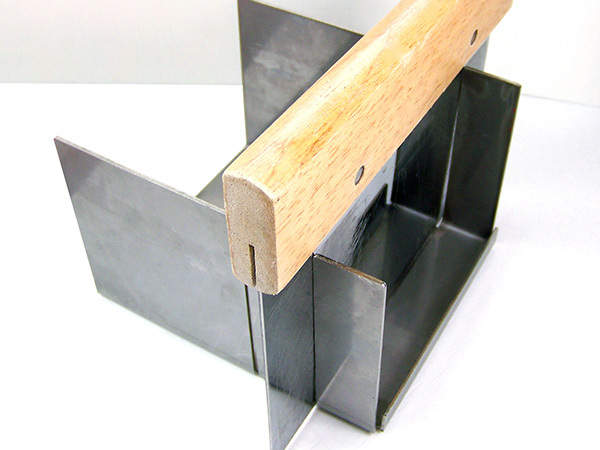 Remove soap from the soap mold and cut with a Miter Box for easier and safer cutting. 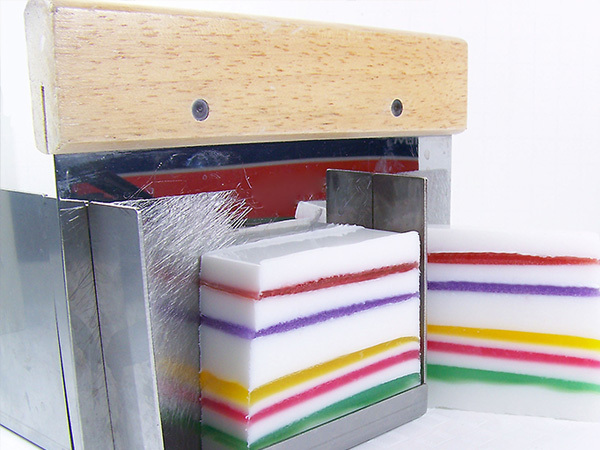 Cutting the loaf in 1-inch bars will yield approximately 9 bars of soap. 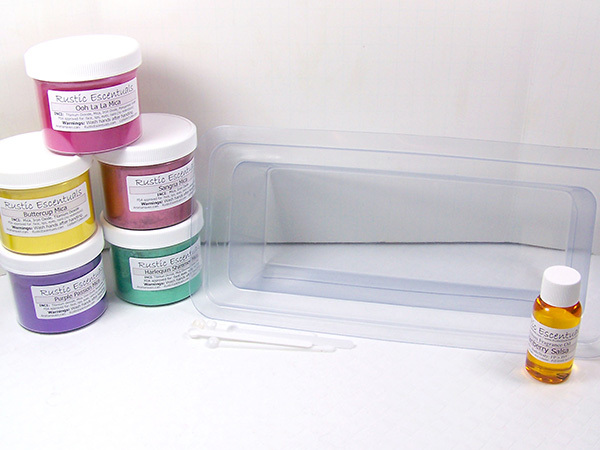 Enjoy being creative with this soap making project – layer different colors or coordinate scents with different shades of the same color. 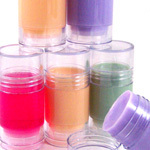 You can make colors suitable to match seasons, holidays, or party themes such as baby showers, birthdays, or weddings.